Synthetic peptide corresponding to Human Bcl-2. ab28819 was affinity-purified from rabbit antiserum by affinity-chromatography using epitope-specific phosphopeptide. The antibody against non-phosphopeptide was removed by chromatography using non-phosphopeptide corresponding to the phosphorylation site. Our Abpromise guarantee covers the use of ab28819 in the following tested applications. Western blot analysis of lysates from HeLa cells treated with LPS (40nM, 30mins), K562 cells treated with calyculin A (50ng/ml, 30mins) and COS-7 cells treated with H2O2 (1ng/ml, 15mins), using BCL-2 (Phospho-Ser70) Antibody. The lane on the right is blocked with the phospho peptide. 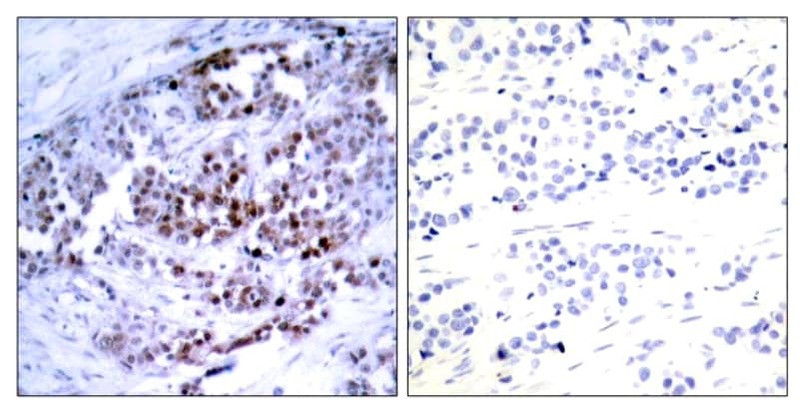 Immunohistochemical analysis of paraffin-embedded breast carcinoma, using anti-Phospho-BCL2(Ser70) antibody (ab28819). Left: Untreated; Right: Treated with synthesized phosphopeptide. Publishing research using ab28819? Please let us know so that we can cite the reference in this datasheet. 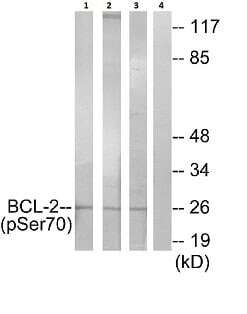 i want to use the Bcl2 (phospho S70) antibody (code ab28819) for a FACS assay. But this antibody is not tested for FACS. Do you know researching groups, who used this antibody for FACs. Besides the celline I use, is from rat. The species reactivity of this antibody is human and mouse, its not tested for other species. Could it also work for rat?